TP Mazembe of DR Congo are preparing for the African Champions League final in Zimbabwe, rather than in Lubumbashi. 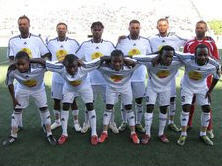 The club returned to Harare on Monday after their 2-1 defeat away to Nigerian club Heartland. Club officials will not say when Mazembe will return to Lubumbashi to play the biggest match ever to be staged there. "All I can say is that they will be here in time for kick-off on Saturday," says club manager Frederic Kitenge. "I know when they are coming, but we don't want to reveal that. There is less pressure for the team when they are in Harare." TP Mazembe are aiming to become African champions for the first time since 1968, and they are in a strong position after their narrow defeat in Owerri. Meanwhile, Heartland are expected to arrive in Lubumbashi on Thursday.